Today we had the privilage of time on our side and decided to head into Duncan to visit the very popular Duncan Farmers Market. I’m sure you notice the chocolate croissant sneaking around behind the sausages right there in the picture. I’m suprised I didn’t get the name of the stall that sold these, however I’m even more suprised that it stayed intact long enough to make it into this fine line up. It’s difficult to refrain from stuffing your mouth with all the delicious goodies available for immediate gratification at this market. So, I didn’t refrain! Cam, mom and I split an order of three items from The Farms Gate catering wagon. We chose the chicken kebab, salmon kebab and the chick pea fries. Mom and I shared the fries (seriously good!) while Cam ate the kebabs (oh, that explains the longer than usual life span of the chocolate croissant!). If you get a chance the chick pea fries are definately worth a try…what a great idea! The crusty exterior and the soft insides were perfect. I have a bin full of dried chick peas in storage, perhaps I shall try to concoct my own tasty fries! We enjoyed the sausages from Ravenstone Farm for supper tonight (sorry, I didn’t take a picture of them once prepared). Both sausages were great, but the Bangers were a big hit…probably because we had them with hash browns and baked beans…yum. Next time I will definately boil them before broiling to soften the casing a little more, but all the same them was some fine sausages! Tomorrow for lunch we will enjoy the spicy humous with crackers and some of those fresh eggs will be boiled and sliced into a green salad. The coffee will be enjoyed all week with breakfast, as will the raw sugar and I still have to figure out what I will be doing with the spicy Sambal with Coconut – chicken dish maybe? I will keep you posted on that one! Have you been to the Duncan Farmers Market this year? 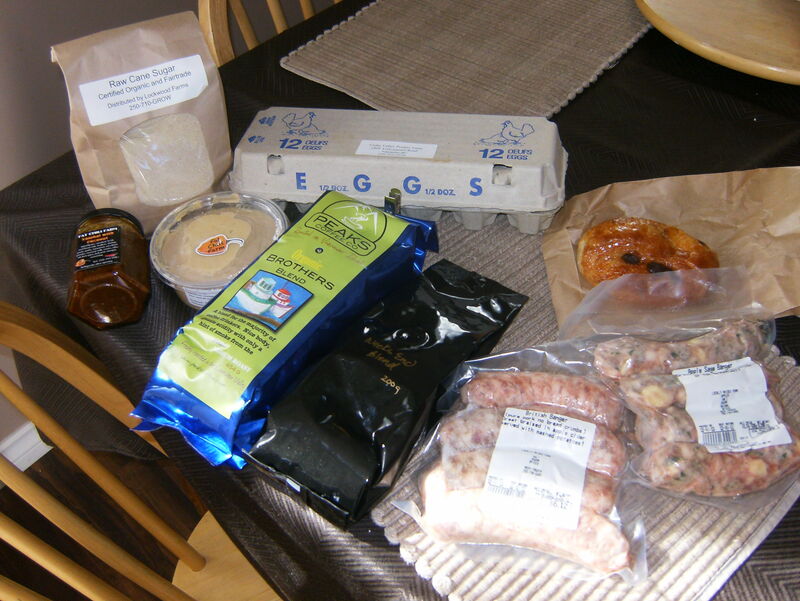 If not, it’s a great way to meet your local food producers, supporting these folks is a great way to help ensure our food security and sustainability here in our beautiful Cowichan Valley and they are such nice people that it is a pleasure to purchase their goodies. If you travel down to the Market on May 19th you will also have a chance to hear Cam’s band Tropic Mayhem play during market hours on the stage in the square…you’ll love the surfing tunes these guys belt out and don’t be suprised if you see the market vendors singing along and shaking their hips to the beat, it’s all part of the great atmosphere!